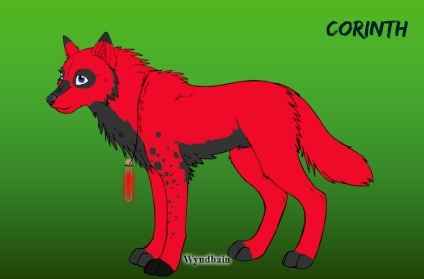 description: Corinth is an average built wolf. He has a bit of a muscular body too. His fur is mostly composed of a light red, but he also has grey and black. Corinth has black around his eyes, and has black fur going from his chest down to his belly. He has some weird spots on his front left leg and his paw is black. He also has the tip of his ears black. Corint has grey paws for all except his front left one. He also has different eye color. One being a light green, and the other one being a dark blue. personality: Corinth is a brave male, that would put his life in danger if needed. He tends to try charming females and flirting with them too, but he is most oftenly being ditched afterwards. Corinth also is quite curious about things. Whenever there is a discusion going on between to wolves, Corinth would try to spy on them as it tends to be curious. Though never but never will Corinth harm anyone. On a beautiful spring morning, A white female, Kari gave birth to four pups, one being Corinth. A healer was within them. Kirito, the father was happy of his beautiful pups. He nuzzled each of them excitedly, but his excitement didn`t last long. They noticed three pups having no fur which was weird to the,As the healer checked each pup, she noticed that they all didn`t have fur too except one, Corinth.The other pups seemed pretty sick and it was most likely that they wouldn`t survive. As the 3 pups without fur tried moving, one by one did they stop and have trouble breathing. Kari and Kirito were panicking. The healer tried her best, but soon she gave up and looked at the parents staright in the eyes. "I`m sorry, but I can`t do anything. It`s the end for them and nothing can cure them." She said. Kari dropped down in tears, while Kirito tried to comfort her. The three of them where watching as their pup`s heart stopped working, and the last puff of air was taking. It was harmful for a mother to watch this. Looking over at the only pup that survived, she nuzzled it gently, before keeping her warm and safe. The whole night time, Kari has been having tears rolling down her cheeks. She had been proud of her success, but it had to end badly. She had been awaiting to finally creat a familly but she failed. She was only taking her pup`s life away. She was just an awful mother to her eyes. A few days past by and Kari still couldn`t get over her pups death so she committed suicide my drowning herself in a lake near her den. As Kirito heard the news, he suddenly changed. He was becoming depressed. Corinth was all he had left. But there was one problem. And this problem was that he didn`t know how to take care of a pup. Kirito new his only choice was to send his pup to someone who could give Corinth a normal life. Corinth kept smiling which made Kirito feel like keeping him, but he just couldn`t. On the next day, as Corinth was asleep, Kirito brought him to a familly who he could trust. Cali and Leo. They were already parents of 3 pups, but they were ready to accept more. Kirito placed Corinth infront of the den before nuzzling gently his pup. He also put on a necklace around his neck. On the necklace it was writtien Forever and his parent`s name.. This necklacce belong to Corinth`s mother, but she was gone now and Kirito wanted him to keep a gift from him. Corinth was soon found and was immediatly carried inside the den. He was being fed and taken care off properly. A week later, Kirito had suicide himself by drowning himself the same place as his mate. Life was getting to hard for him, and he couldn`t continue living on his own. Soon Corinth was old enough to play outside with the others. For the moment, he thought Cali and Leo where his actual parents, He was quite curious about one thing though. Why did everyone look like his parents, but not him. The other pups would call him an orphan as they knew the truth about Corinth, but he didn`t. It wasn`t until he reached 2 years and a half did Cali reveal the truth to Corinth. For some reasons, Corinth felt betrayed.At first he didn`t believe the story, until he looked up at his necklace seeing his real parent`s name. He was the only survivor in his familly it meant, which nearly made him feel uncomfortable. Corinth nodded slightly before walking away, fustration filling his mind. As he was walking away from the pack, a wolf jumped on him and accidently scratched him on the side which becames scars. The wolf immediately ran away from him, leaving Corinthonce again alone. The male made his way away from his pack as it didn`t seem like home to him anymore. Corinth crushes alot of fruits at times. Planning on buying the necklace he has around his neck. "Life is just a hard obstical, that I still haven`t managed to succeed." The secret password is New Breed.